Planet Express attack on the Mombil "mine"
Due to Mom artificially increasing the prices of dark matter in 3008, the Planet Express crew planned to infiltrate the only dark matter mine on Earth, thus initiating the Planet Express attack on the Mombil "mine" (BG). 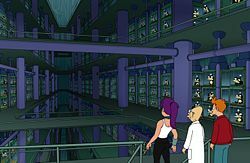 Once inside, they planned to bring the Professor's anti-backwards crystal into contact with Mom's single non-local metaparticle, which would cause a chain reaction and make all dark matter worthless. After distracting the defending Killbots, the crew made their way into the mine, only to discover that it was actually a farm where Nibblonians were force-fed in order to produce dark matter. After discovering this, the crew made their way towards Mom's office, but were caught shortly after. Just as they were about to fail, Bender's imagination caused the crew, Mom and her sons to fall into Cornwood. This page was last edited on 19 September 2014, at 20:00.